Discos are great. The sense of togetherness you get as you all do the Cha Cha Slide. Singing along to Grease Megamix. Moving away from school discos and weddings for a moment, there is just a lot of fun to be had from mutual appreciation of a familiar song. And yes, this might all the while be accompanied by a discordant variety of interpretive dance moves from ironic 60s finger pointing to that girl in the corner who thinks she’s Beyonce. But there’s an order to it in that you’re all bopping to the same tune. 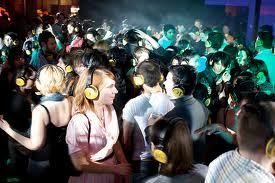 Silent discos take away this consolation. Silent discos force you to don a pair a heavy, clunky headphones, trapping yourself in a solipsistic state where you consciously commit yourself to the torture of ‘Barbie Girl’ or ‘I’ve Got a Feeling’ for the umpteenth time. All the while, you are glancing awkwardly at the person next to you and feeling more than usually self-conscious about your token fist-pounding routine. A large part of the supposed ‘fun’ of it, I am informed, is taking off your headphones and listening to everyone else tunelessly singing along to different songs. Really?! Personally this is a fate I wouldn’t wish on anyone, save those unlucky enough to stand outside the bathroom for my shower performance. And equally I can do without a mash-up of everyone else’s drunken renditions.